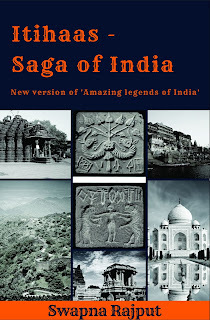 Home Blog Books Feature 'Itihaas-Saga Of India' New book cover curtain raiser! This is the curtain raiser of much awaited version of my new title Itihaas-Saga of India. Itihaas means history in Sanskrit. Indian history is the oldest history in the world, which is still an enigma and has hidden unknown number of mysteries and stories, you want to satisfy your zeal to know about this great country and all its heroes in one place then this book is the best option for you. India has always been an attraction point in the world, millions of curious people from around the world visit here and wonder how one country could always stay glorious with so many languages, cultures and traditions? It is all because of the eternal Vedic culture and those ancient heroes who created and preserved it with their knowledge and passion which magnetized the world to come and see the fame of India and follow its culture. 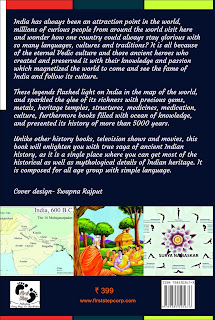 These legends flashed light on India in the map of the world, and sparkled the glee of its richness with precious gems, metals, heritage temples, structures, medicines, medication, culture, furthermore books filled with ocean of knowledge, and presented its history of more than 5000 years. Unlike other history books, television shows and movies, this book will enlighten you with true saga of ancient Indian history, as it is a single place where you can get most of the historical as well as mythological details of Indian heritage. It is composed for all age group with simple language. Print copy available on Flipkart India, with ample space on both the sides of every page so that the readers can note comments in the book. Great book I guess. It is about our country and I would love to read about it. India is one such country where we practice mixed culture and traditions. So foreigners are really curious to know more about us. Thank you for providing the link. I will definitely read this.